One of Whistler’s most spectacular waterfalls is Alexander Falls, located in the Callaghan Valley region near the area where the 2010 Olympic Nordic events took place. The waterfall is easy to access by car and the viewing platform is right next to the parking lot, so no walking or hiking is required. The waterfall drops an impressive 43 meteres (141 feet) over three sections and is about 12 meters (40 feet) wide at its widest point. The source of the water comes from Madelay Creek which is fed by several rivers and creeks in the Callaghan Valley region. Alexander Falls located in the Callaghan Valley area, just south of Whistler, BC. It was just before the 2010 Olympics when the area was opened up for several Nordic sports that Alexander Falls became more accessible. 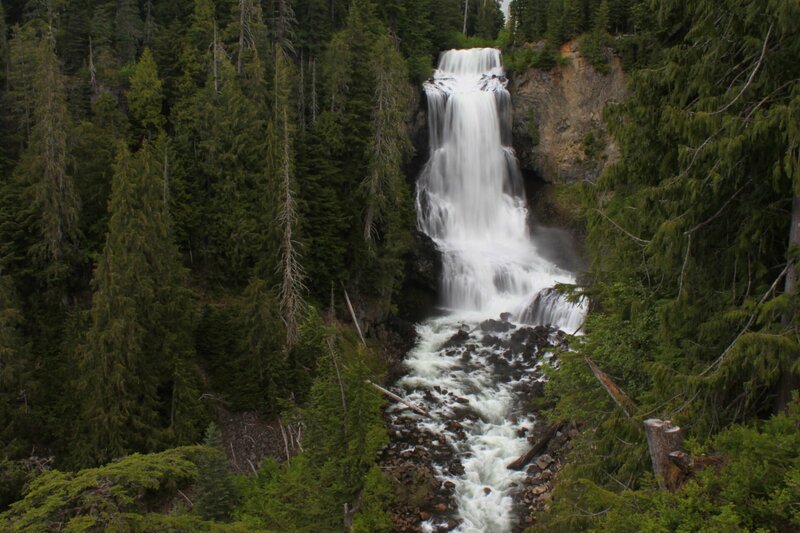 Before 2010, the waterfall could only be accessed by a remote forest service road and then by walking on a rough trail to a viewpoint. Now, the road to the falls is paved and access is much easier, which should lead to an increase in popularity and people driving out to see this spectacular waterfall. Spectacular Alexander Falls and the water flowing down Madeley Creek. The best time of year to view the waterfall is late-spring or early-summer (May / June) when all the snow on the nearby mountains is rapidly melting, providing a powerful force of water falling over the rocks. During the winter months, the water typically freezes due to the waterfall’s location at a high elevation. To get to Alexander Falls, drive south from Whistler for about 10km until you see a sign on the right to Callaghan Valley. Turn right onto the Callaghan Valley Road and follow the paved road for another 10km. Watch for signs on the left for Alexander Falls and pull into the large gravel parking lot. The waterfall is viewable from the wooden platform at the corner of the parking lot. Is there a trail to go down to the base of the falls? Yes, there is a trail that leads to the very bottom.